“…Some time ago, back when there was rabid fuel scarcity, I did something that I am not too proud of. Driving on a low tank of fuel, I was forced to head to a fuel station. Arriving at the fuel station, I met an incredibly long queue, to which I joined. With the queue not moving and having been there for a while, I concluded that queuing at the station indefinitely was not an option I was willing to embrace. So, I decided to leave the queue and drive up to the station. As I approached the station, lots of young men offering black-market fuel approached me. I thought about obliging the black-market trade fleetingly, but eventually decided against it. I settled on cutting my losses, going home and sending a driver to join the queue instead. But then, a well-dressed middle-aged man approached my vehicle and asked if I wanted fuel from the station. Satisfied and smug, I drove out of the station. Feeling a little guilty and sorry for those I had bypassed on the fuel queue, I turned to look at them. That was when I made eye contact with a woman in the queue who was on the driver’s seat in a car. She had three young children in the back seat. The kids looked like they were all under ten years old. The youngest was crying non-stop and the two elder kids seemed to be fighting. Between trying to console the younger child and trying to mediate the fight with the older children, she turned and looked at me. She had the most desperate, forlorn and tired look on her face. She was sweating and looked overwhelmed. That was when a large surge of disappointment followed by utter guilt hit me. Thinking that I had dishonestly paid a bribe, jumped the queue and shortchanged law-abiding Nigerians, while a woman was doing the right thing by following the queue, despite her circumstance, made me feel so bad, guilty and disgusted with myself. It was then that I had an “A-Ha moment’ about what the change, that so many Nigerians fought to have was. What it symbolised! By God’s Grace, as I sit here, in this crispy New Year, watching my fellow countrymen and women ask where exactly the change is, I am reminded of my misadventure that day on the fuel queue. So, when we speak of Nigeria’s urgency to see ‘change,’ whom do we expect that change to come from? The expectation for change has been fixated on the government. A long ‘To-Do’ list has been placed at the foot of the President. But in reality, the wind of change that ushered in a new government in the last election wasn’t so much about voting one man into office. It was about the need of a people to see a change in the very fabric and marrow of their country. And if that is what it was, then it includes every single one of us that considers ourselves a member of the collective known as Nigeria! We live in a time when people speak about requests in terms of needs, needs in terms of rights, and rights in terms of entitlements. Government, and government alone, is thought as being compelled to provide the expected change. And while such an expectation may be valid to a large extent, we have to refer to the very concept of responsibility and accountability when we speak of the mantra of change that recently took hold of and shook Nigeria. To be responsible is to be answerable for one’s action. When one acknowledges a legitimate call to do something, one has a duty to respond. Accountability rests not only on a genuine call for action, but also in the ability to heed the call. Just as the president and the government has a responsibility to us and to the nation, we each also have a responsibility to every other Nigerian and to the nation at large. Once both the government and Nigerians accepted the call for action, which we did when we voted for change, then we all have that responsibility to heed its call. What happened in the elections of 2015 was Nigeria’s call. What we did in voting for change was to heed that call. Now we have a responsibility to follow it through. Indeed, the elections of 2015 saw a nation’s call for change. Nigerians heeded and opted for that change. But our responsibility didn’t stop after the inauguration. Responsibility doesn’t usually come from one single establishment or one union. Individuals in a family or a community bear the responsibility to care for their members, in the same way that friends, neighbours, leaders and governments do. Although we should all have expectations for the government to implement policies, which will make our existence as Nigerians more comfortable, we should be aware that we each have a role to play in that journey to change. Every single Nigerian has a role to play in actualising change. While the government has a great responsibility to attain the parameters needed for us to grow and flourish, one must be realistic and keep in mind that the government isn’t ‘solely’ liable for taking care of every single one of us in our communities, neighbourhoods and families. That obligation is the responsibility of every single one of us as participants in a variety of relationships and overlapping communities. One will intrinsically be indebted to fellow members by a shared principle, which unites their community and, as members of a shared community, we must rely on each other to attain common objectives. That would entail making claims upon each other as we collectively strive to satisfy the ideals our society struggles to actualise. If every single one of us, in our capacity as Nigerians, can make a change that will make Nigeria better, then we will see the change we yearn for. If not, then it doesn’t matter what policies the government puts in place; there will never be change! As a nation, we are persons existing in a community, not self-standing individuals. People are not islands and we deny an important feature of our humanity once we approach it as such. Each of us share some manner of link to one another; every one of us exists in a human society. Our actions have a domino effect on Nigeria and, thus, each have central moral obligations towards our collective. Part of the government’s role is to employ public judgment when it comes to justice. The connection between government and its citizens is one of equal standing and protection under the law. We have got to understand that the government’s responsibility is not to be the ‘sole’ harbinger of change. We each have that responsibility also. Let us say that the government is able to achieve some of its main objectives in its change manifesto and I, as a part of this huge collective, continue to jump the fuel queue, as does the next person and the next person, then the expectation of change is incapacitated and untenable; purely because we are not playing our part. It is like a big jigsaw puzzle and we each represent a piece of it. Any of the expectations we have towards government, as far as change goes, has got to start with us – each one of us! As long as we are talking about government responsibility to deliver change, we must also examine our own personal irresponsibility, which has an effect on that change. Besides government, we also have a collective responsibility to provide a better example so that those who come after us aren’t propelled towards bad choices. Having been part of an opposition movement since 2003, I am not sure whether I am truly being objective about this concept of change, now that a former opposition forms the government. I cannot say whether I am being fair to all the governments that came prior to this present administration. But, here and now, I honestly see this concept of change as being the responsibility of each and every single Nigerian. The change that Nigeria desperately needs starts when I don’t pay a bribe to jump the fuel queue; the change starts with every single one of us! While I am waiting to see the government finish putting into effect its policies relating to change, I’m determined never to jump a fuel queue or any other queue again. 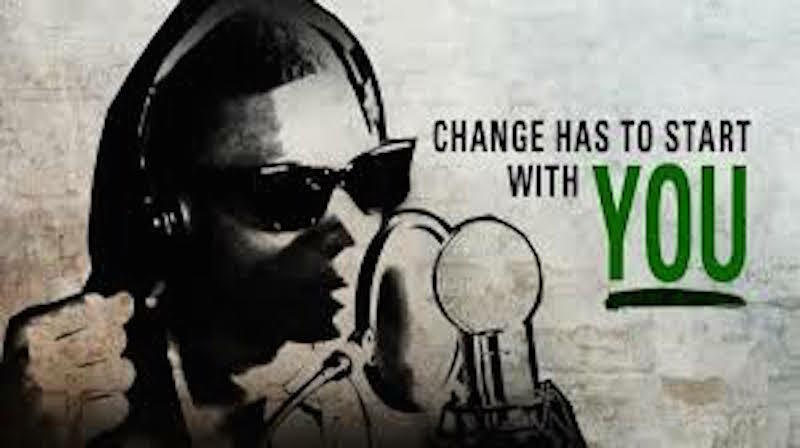 When it is clear that Nigeria will never change if we sever our desire for change at the threshold of government alone; when we know that our self-destructive behaviour batters the mantra of change that Nigerians chanted one year ago, is it not time we end our own personal unprogressive conduct? The change that Nigeria desperately needs starts when I don’t pay a bribe to jump the fuel queue; the change starts with every single one of us! Hannatu Musawa is on Twitter: @hanneymusawa; www.hanneymusawa.com; www.facebook.com/hannatu.musawa; and www.youtube.com/HannatuMusawa.